I traveled 7,652 miles to talk about America. Earlier this month, my colleague Steve Sjuggerud led an investment tour of China. He invited me and some Stansberry Research analysts to join a select handful of subscribers. We spent time in Beijing, Shanghai, and Hong Kong. Our conference days were filled meeting with chief financial officers from NYSE-listed Chinese companies, heads of money management firms, and NYSE-listed travel businesses… And we got to look into the marketing and financial plans of China. After seeing the place and talking with the leaders, it’s clear that China will play a larger role in our investing ideas. Near the end of our trip, we carved out time to huddle with our traveling subscribers in a conference room at the Mandarin Oriental in Shanghai so I could share my economic outlook with them. Rather than reflect on China, everybody really wanted to know what’s going on with stocks and bonds here in the U.S. Since the perfectly rising bull market stalled in February, the mood among investors has changed. Worry has set in… And while the economic data is still strong, the “global synchronized growth” story has pared back a bit with weaker numbers in Europe and turmoil over trade and tariffs. Everybody wants some clarity on what’s going on in the economy and markets – at the very least to guide future asset allocations. Some traveled all the way to China to hear this Minnesota boy’s outlook. And my antennae are up for signs of coming danger. You can find a thousand economic indicators out there to watch. Today, you only need to focus on one. In short, we won’t see the economy or market get rough until the employment picture changes. Unemployment dropped to 3.8% in May… a historically low level. But history tells us that when unemployment starts to tick up, it’s a great sign for marking the peak in the market. My team and I are watching each key economic indicator as it comes out for the first sign of weakness. And we’ve got to parse out what’s a transitory “bad number” and a true sign of a turn in economic activity. For market watchers like us, this is the most fun we’ve had in years. Because while the economy is booming – “boom,” to me, always implies a bust. Are you on vacation? We aren’t, and our mailbag is getting quiet. Send your questions, gripes, and wisdom to [email protected]. We love reading every single e-mail. Q: [Referring to] the 1234, 1234567, 12345678 breathing cycle. Why only five times, and how many times a day can one do it? – G.B.D. A: There are two breathing methods we’ve recommended: the 4-7-8 method and simply counting your breaths. For the 4-7-8 method, inhale through your nose for a count of four. Hold your breath for a count of seven. Then exhale through your mouth for a count of eight. Do this cycle four times. Or you can go for a longer period and count your breaths. Always count as you exhale. Take five breaths and then start over with “one” again. So why five? That’s usually enough to trigger your relaxation response. But if you’re in a situation where, for instance, you’re having a panic attack, you can continue to count your breaths. Q: How do I calculate my stops? Do I just keep them following the stock as it rises? – C.B. A: There are two types of stop losses: hard stops and trailing stops. Hard stops are based on a set price or percentage below the purchase price. If the stock falls to that amount at any time, you sell. Let’s say you purchase WidgetMaker shares at $10 and set a 20% hard stop at $8. No matter what the stock price rises to for WidgetMaker, once it falls to $8, you would sell. Trailing stops are based on a percentage below the purchase price, but they don’t stay the same. As the stock price rises, the trailing stop follows it. For a trailing stop, let’s say you would initially set it at 20% below your purchase price. So for WidgetMaker, you’d start out at $8, the same as a hard stop. Here’s the difference… As WidgetMaker’s price rises, the trailing stop also rises. So if the stock rises to $11, the stop would rise to $8.80. If WidgetMaker jumps up to $15, the stop would be $12. Trailing stops only adjust upward and stay set on the highest price the stock hits. So in this example, if the stock hits $15 and then goes down, you would sell at your trailing stop of $12. But suppose the stock falls to $12 and you sell, and then it shoots up much higher. In that case, you’ve still made a $2 profit ($12 minus your $10 purchase price)… but you’ve forfeited any future gains. Q: Several of your recommendations are for muni-bond funds. Many of us retirees have our investments in IRAs, both regular and Roth. Most advisers say it is a waste to invest in municipals within an IRA because of the double tax exemption. How can those of us in a similar situation get the most benefits of muni funds? I am assuming that a muni fund has the same tax benefits as a muni bond, of course. – D.B. A: Yes, it’s generally a waste of the tax benefit to use an IRA to invest in municipal bonds. The thing about tax-deferred accounts is that they have maximum contribution levels, so savers can only get so much into these types of accounts. Since municipal bonds and municipal-bond funds are exempt from federal taxes, holding them in an IRA wastes space that could be used for less tax-efficient holdings like dividend-paying stocks and interest-bearing bonds. On top of that, the earnings you get on your municipal bonds actually will be taxed like income when you start to make withdrawals. So always, always keep your municipal-bond investments outside of your tax-deferred accounts. The Fourth of July is the deadliest holiday in the U.S. Between car accidents, fireworks, and drowning, hundreds of Americans are injured or killed each year on the 4th. And mosquitoes, ticks, and food poisoning present risks to our health too. 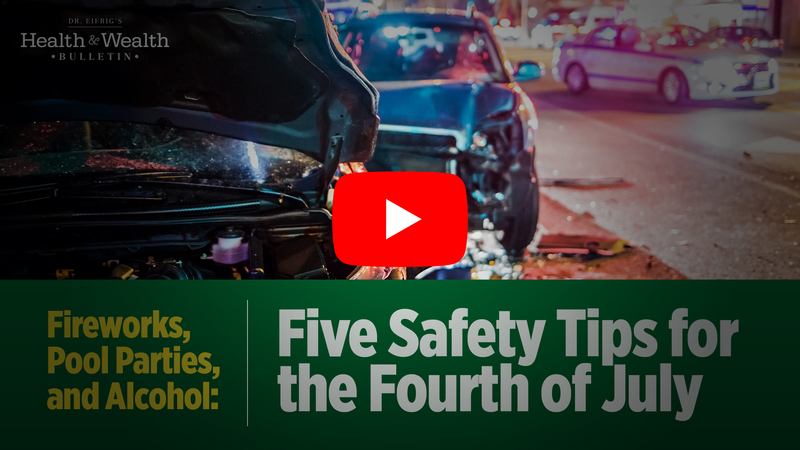 That’s why this week, research writer Amanda Cuocci covers five ways to stay safe while celebrating, including common sense guidelines. Click below to watch. Watch out for this popular “set it and forget it” investment. Did you miss it? When your immune system attacks. Something different: Switzerland’s mysterious fourth language.